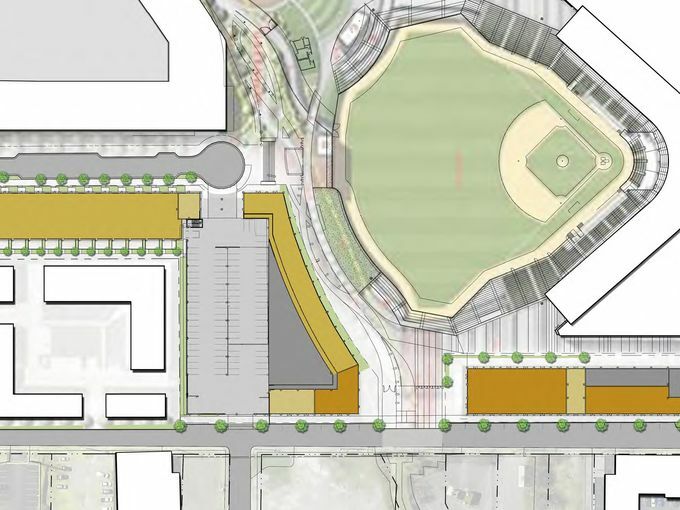 A ballpark village encompassing some 400 apartments and 25,000 square feet of retail is being pitched for open space next to First Tennessee Park, home of the Nashville Sounds (Class AAA; Pacific Coast League). Development has always been part of the game plan for the First Tennessee Park area, as the city targeted the region between Germantown and downtown as a prime spot for investment. That potential for development was built into the ballpark design, and while some of the development is already underway, more is planned. The development team, Ward Brothers Development, is eyeing a groundbreaking in the fall on the project called “Ballpark Apartments” and an opening in spring 2018. David Powell, principal of Nashville-based Hastings Architecture Associates, said the project’s design team sought to play off the old warehouses of the nearby historic Germantown neighborhood. He also said they drew inspiration from Camden Yards, the home stadium of Major League Baseball’s Baltimore Orioles known for its iconic warehouse beyond right field and skyline view beyond left field. “Anybody who’s been around architecture that has anything to do with baseball stadiums in the last 20 years knows that Camden Yards is the great precedent,” Powell said. Frank Ward promised $50 million in private investment as part of the public financing plan for the $75 million ballpark, and this project would count toward that pledge. So, basically, the increased property taxes paid on this privately financed project will help pay for the new ballpark. Images courtesy Hastings Architecture Associates.